Lymphedema involves blockage of the lymph vessels, with a resulting accumulation of lymphatic fluid in the interstitial tissues of the body. The lymphatic system consists of lymph vessels and lymph nodes throughout the body. The lymph vessels collect lymphatic fluid, which consists of protein, water, fats, and wastes from cells. The lymph vessels transport the fluid to the lymph nodes, where waste materials and foreign materials are filtered out from the fluid. The fluid is then returned to the blood. When the vessels are damaged or missing, the lymph fluid cannot move freely throughout the system but accumulates. This accumulation of fluid results in abnormal swelling of the arm(s) or leg(s), and occasionally swelling in other parts of the body. Lymphedema is a very serious condition. There is no cure for lymphedema and once it develops, it can be a long-term, uncomfortable, and sometimes painful condition requiring daily treatment. When lymphedema is not treated, the protein-rich fluid continues to accumulate, leading to even more swelling and hardening (referred to as fibrosis) of the tissues. This fluid is a good culture medium for bacteria, thus resulting in reoccurring infections when there are injuries to the skin, decrease or loss of functioning of the affected limbs, and skin breakdown. Infections, referred to lymphangitis, can affect the connective tissue under the skin. Repeated infections may result in scarring, which in turn makes the tissue susceptible to more swelling and infection. Over time, these infections result in tissue hardening (i.e., fibrosis), which is a characteristic of advanced chronic lymphedema. In very severe cases, untreated lymphedema may even result in a rare form of lymphatic cancer called lymphangiosarcoma. Lymphedema affects approximately 100 million people worldwide, including at least 3 million people in the United States. tight fitting of a ring, wristwatch, or bracelet, without a gain in weight. In 90% of the cases, lymphedema is diagnosed through observations, measurements, and symptoms. The remaining 10% require the use of more complex diagnostic tests such as lymphoscintigraphy. Lymphoscintigraphy is a technique in which a radioactive substance that concentrates in the lymphatic vessels is injected into the affected tissue and is mapped using a gamma camera, which images the location of the radioactive tracer. Magnetic resonance imaging (MRI), computed tomography (CT) scanning, and duplex ultrasound are imaging techniques that are also sometimes used as diagnostic tools for lymphedema. Stage 3 (lymphostatic elephantiasis)—swelling is irreversible and the affected areas are very swollen. The skin hardens and begins to break down, fibrosis is more extensive, and patients may need surgery to remove some of the swollen tissues. Primary lymphedema is an inherited condition, where the patient is born without lymph vessels and nodes. The swelling associated with primary lymphedema usually occurs during adolescence and affects the foot or calf. A rare form of primary lymphedema, called Milroy's Disease, occurs in pregnancy. However, secondary lymphedema, or acquired lymphedema, develops as a result of an injury to the lymph system. Specific causes include surgical treatments for certain types of cancers, especially those cancers that currently require the removal of lymph nodes. Radiation treatment for cancer or for some AIDs-related diseases such as Kaposi-Sarcoma may also result in lymphedema, as radiation may damage or destroy lymph nodes or cause the formation of scar tissue that can interrupt the normal flow of the lymphatic fluid. Specific cancers and their treatment that may result in lymphedema include malignant melanoma, breast (in both women and men), gynecological, head and neck, prostate, testicular, bladder, and colon cancer. Other causes of lymphedema include trauma to the lymphatic system from burns, liposuction, tattooing, injuries, surgery, radiation, obesity, heart or circulatory disease, and multiple sclerosis. Lymphedema in people at risk may not develop the condition immediately, but develop the condition weeks, months, or even years later. Aircraft travel has been linked to the development of lymphedema in patients after cancer surgery, possible due to the decreased cabin pressure. In Western countries, one of the most common causes of lymphedema is mastectomy with axillary dissection (removal of the breast and underarm lymph tissue for treatment of breast cancer), which may result in lymphedema of the breast, underarm, or arm on the side of the surgery in 10-20% of patients. This occurs because the lymphatic drainage of the arm passes through the axilla (armpit), and tissue in the axilla is removed during the mastectomy. To reduce the risk of developing lymphedema after breast cancer treatment, there is an alternative treatment that avoids axillary lymph node dissection. Sentinel lymph node biopsy is a new diagnostic procedure used to determine whether the breast cancer has spread (metastasized) to axillary lymph nodes. A sentinel lymph node biopsy requires the removal of only one to three lymph nodes for close review by a pathologist. If the sentinel nodes do not contain tumor (cancer) cells, this may eliminate the need to remove additional lymph nodes in the axillary area. Early research on this technique indicates that sentinel lymph node biopsy may be associated with less pain and fewer complications than standard axillary dissection. Because the procedure is so new, long term data are not yet available. However, there is still a risk for developing lymphedema because of follow-up radiation treatments or chemotherapy, which may also damage the lymph nodes. Persons who have developed lymphedema after cancer treatment should be checked for a possible reoccurrence of cancer if they experience a sudden increase of swelling, for the tumor growth may be responsible for blocking lymphatic flow. improve the overall health of the patient. However, some lymphedema specialists feel that lymphedema patients with metastatic cancer should not be treated with CDT, to prevent the spreading of the cancer. MLD was developed in 1932 in Denmark by a doctor and his wife. It was widely used in Europe and now is accepted as a therapy for lymphedema patients in the United States. In MLD a series of rhythmic, light strokes are made in a specific sequence along the lymphatic vessels and the adjoining tissues. These movements remove the lymph fluids from the tissues and return them to the circulatory system, thus reducing swelling in the affected area. Compression techniques include the use of compression garments, compression aids, and compression bandages. These techniques encourage natural drainage and prevent swelling by supporting tissues in a way that aids in drainage. Compression garments are knit, stretch sleeves or stockings. Compression aids are custom-fitted sleeves, stockings, or pads made of fabric-covered foam. Bandages are an effective and flexible means of compression. They work when the patient is active or is resting and can easily be adjusted to fit changing limb sizes. However, the bandage should be a special type of short-stretch bandage and not the long-stretch bandage that is commonly known as Ace bandages. Only persons who are trained in lymphedema therapy should tape or wrap swollen areas. Self-care techniques are practiced by the patient or his or her caregiver at home, between visits to the therapist. Self-care techniques include self-massage, skin care to maintain healthy tissue, nutritious diet, and exercise to increase lymph flow, increase mobility, and to improve the patient's general health. Exposure to extreme heat has the potential to increase lymphedema swelling, so an affected person or a person at risk of developing lymphedema should avoid hot tubs, saunas, and steam rooms. To keep the affected extremities as healthy as possible, a person with lymphedema should keep the swollen areas clean and avoid heavy lifting and pulling as well as avoid any type of trauma, such as cuts, bruises, sunburn or other burns, injections, sports injuries, insect bites, or cat scratches. Some doctors and lymphedema therapists recommend that a person with lymphedema use a preventative course of antibiotics when having dental treatment, that is, starting antibiotics several days before the appointment and continuing several days afterwards. A person at risk of developing lymphedema (for example, a woman who has been treated for breast cancer) should also observe the same type of precautions to prevent the development of the condition. If infections occur, then all treatments for lymphedema should be discontinued while the infection is present, and the infection treated with antibiotics. Surgery is sometimes used to remove excess tissue ("debulking") if the swollen limb becomes so large and heavy as to interfere with movement. Exercise is important for a person with lymphedema, but only in moderation. If the extremity starts to ache, the person should lie down and elevate the swollen limb. Recommended exercises include walking, swimming, light aerobics, bike riding, and yoga. Persons with lymphedema should wear a lymphedema alert bracelet or necklace for safety during a medical emergency, explaining the risk of infections. They may also benefit from counseling and membership in support groups to deal with the psychological impact of the disease. Sometimes patients with lymphedema will be denied insurance coverage for treatment; as a result patient advocacy groups in 2005 are attempting to get a law passed through the U.S. Congress guaranteeing insurance coverage for lymphedema. The use of clinical aromatherapy in conjunction with CDT may improve the quality of life for persons with lymphedema. Clinical aromatherapy involves the use of essential oils to improve the functioning of the immune system, for the immune system is closely associated with the lymphatic system. Also a massage oil comprised of a blend of frankincense, grapefruit, hyssop, and lavender, may be used to soften scarred and fibrotic tissues. Radiation treatments can cause skin contractures, which can be helped by massage with a blend of cajeput, frankincense, hyssop, lavender, sage, and tea tree. Radiation can also have adverse effects on the bowel, resulting in poor bowel functioning, scarring, and activity restrictions. Massaging the abdomen with a blend of grapefruit, fennel, helichrysum, lavender, myrrh, and sage may improve intestinal functions. When compression techniques are used, the underlying skin can be treated with a blend of bay laurel, chamomile, geranium, helchrysum, lavender, patchouli, and vetiver in a combination of castor oil, safflower oil, and grapeseed oil as carrier oils. Good skin care is important in preventing infections. Body oils that contain cajeput, cypress, lavender, marjoram, and rosewood can be applied after bathing to keep the skin moist and healthy. Finger nail beds can be a portal of entry for infections, so can be kept moist with an essential oil blend of chamomile, geranium, lavender, lemon, sage, tea tree, and ylang ylang. Burt, Jeannie, and White, Gwen. Lymphedema: A Breast Cancer Patient's Guide to Prevention and Healing. Berkeley, CA: Publisher's Group West, 1999. French, Ramona Moody. Milady's Guide to Lymph Drainage Massage. Clifton Park, NY: Milady Publishing, 2003. Kelly, Deborah G. A Primer on Lymphedema. Essex, United Kingdom: Pearson Education, 2001. Parker, James N. and Parker, Philip M.. San Diego, CA: Icon Health Publications, 2004. Axillary nodes — Lymph nodes found in the armpit that drain the lymph channels from the breast. Clinical aromatherapy — Aromatherapy is the therapeutic use of plant-derived, aromatic essential oils to promote physical and psychological well-being. It is sometimes used in combination with massage and other therapeutic techniques as part of a holistic treatment approach. Debulking — General term used for surgeries in which subcutaneous tissue is removed from lymphodemous limb. Fibrosis — Formation of fibrous tissue as a reaction or as a repair process; may occur due to treatment and/or disease. in lymphedema condition known as hardening of the limb with resulting restriction of circulatory flow, increased infection, and weeping sores. Fibrotic — Pertaining to or characterized by fibrosis. In dermatological description, "fibrotic" would be used to describe leathery, bound-down, or thickened, scarred skin. Interstitial fluid — The fluid between cells in tissues. Referred to as the liquid subtance of the body. Interstitial space — The fluid filled areas that surround the cells of a given tissue; also known as tissue space. Long-stretch bandages — Specialized bandages, similar to an Ace bandage, that have 100 to 200% stretch. Low-stretch bandage — Specialized bandages, with 30 to 90% stretch, that are used to obtain the correct compression during the treatment of lymphedema; also known as short-stretch bandages. Lymph — The almost colourless fluid that bathes body tissues and is found in the lymphatic vessels that drain the tissues of the fluid that filters across the blood vessel walls from blood. Lymph carries antibodies and lymphocytes (white blood cells that help fight infection) that have entered the lymph nodes from the blood. Lymph nodes — Small bean-shaped organs of the immune system, distributed widely throughout the body and linked by lymphatic vessels. Lymph nodes are garrisons of B, T, and other immune cells. Lymph System — When sickness or infection invades the body, the immune system is the first line of defense. A big part of that defense is the lymph system. Lymph is carried through the body by lymph vessels that have valves and muscles to help move the fluid. Along the route are lymph nodes that serve as filters for harmful substances. This network of vessels and nodes together is called the lymph system. Lymphatic fluid — The clear fluid found outside the cells which bathes the tissues. It is collected, filtered, and transported by the lymphatic system from around the tissues to the blood circulatory system. Fluid that collects as a result of lymphedema. Nail beds — The underlying connective tissue that nourishes the finger and toenails. Pitting edema — When a swollen area is pressed, the pressure leaves an indentation (pit) that takes time to fill back in. Sentinel node biopsy — A newer procedure performed in order to determine whether breast cancer has spread to auxiliary (underarm) lymph nodes. A blue radioactive tracer and/or blue dye is injected into the area of the breast tumor. The lymphatic vessels carry the dye or radioactive material, to a "sentinel node". This sentinel node is thought to be the first lymph node receiving fluid from the tumor and the one most likely to contain cancer cells if the cancer has spread. Only if the sentinel node contains cancer cells are more lymph nodes removed. Skin contracture — A permanent tightening of the skin that prevents normal movement of the associated body part and that can cause permanent deformity. A contracture develops when the normally elastic connective tissues are replaced by inelastic fibrous tissue. This makes the affected area resistant to stretching and prevents normal movement. chronic swelling of a part due to accumulation of interstitial fluid (edema) secondary to obstruction of lymphatic vessels or lymph nodes. primary lymphedema lymphedema that appears spontaneously without known cause. See table. Swelling (especially in subcutaneous tissues) as a result of obstruction of lymphatic vessels or lymph nodes and the accumulation of large amounts of lymph in the affected region. /lym·phe·de·ma/ (lim″fah-de´mah) chronic swelling of a part due to accumulation of interstitial fluid (edema) secondary to obstruction of lymphatic vessels or lymph nodes. a primary or secondary condition characterized by the accumulation of lymph in soft tissue and the resultant swelling caused by inflammation, obstruction, or removal of lymph channels. 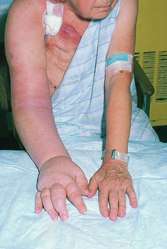 Congenital lymphedema (Milroy's disease) is a hereditary disorder characterized by chronic lymphatic obstruction. Lymphedema praecox occurs in adolescence, chiefly in females, and causes puffiness and swelling of the lower limbs, apparently because of hyperplastic development of lymph vessels. Secondary lymphedema may follow surgical removal of lymph channels in mastectomy, obstruction of lymph drainage caused by malignant tumors, or the infestation of lymph vessels with adult filarial parasites. Lymphedema of the lower extremities begins with mild swelling of the foot, gradually extends to the entire limb, and is aggravated by prolonged standing, pregnancy, obesity, warm weather, and the menstrual period. The disorder has no cure, but lymph drainage from the extremity can be improved if the patient sleeps with the foot of the bed elevated 4 to 8 inches, wears elastic stockings, and takes moderate exercise regularly. Light massage in the direction of the lymph flow and thiazide diuretics may be prescribed. Constricting clothing and salty or spicy foods that increase thirst are contraindicated. Surgery may be performed to remove hypertrophied lymph channels and disfiguring tissue. lymphedematose, lymphedematous, adj. Lymphedema occurs in four stages (0 to 3): 0. Subclinical stage in which lymph transport is known to be impaired, but no signs or symptoms are obvious (may last for years); 1. Tissue is soft with pitting edema; swelling decreases with elevation; 2. Tissue is swollen but firmer and thus may not show pitting; edema does not resolve completely with elevation; and 3. The affected limb is grossly enlarged and misshapen; skin breakdown and infection often occur. Symptoms of lymphedema may include a feeling of heaviness, tiredness, aching, weakness, and fullness in a limb that impairs flexibility or interfers with the wearing of jewelry, watches, or clothing. Treatment goals include maintaining use of the affected limb and preventing complications. A combination of manual lymphatic drainage, compression devices, and protection of the affected limb can make a positive difference in a patient’s quality of life. Patient management by physiatrists, other physicians experienced in lymphedema care, certified nurses, and therapists is crucial. Careful measurement of the affected limb with comparison to its opposite and diagnostic testing help to rule out other causes. If necessary, lymphangioscintigraphy can be used to examine the anatomy and functioning of the lymph system. Patients and their partners can be taught effective techniques to use at home. Compression devices are fitted over the affected limb to help maintain or reduce swelling. Compression pumps use air or fluid pressure to mimic massage’s beneficial effects. They are designed to move lymphatic fluid back toward functional nodes by providing sequential, even pressure from the distal to the proximal portions of the affected limb. Compression sleeves or stockings should be fitted by a professional, as an improperly fitted device may irritate skin and other tissues, resulting in additional swelling. Sensible weight reduction programs based on mild caloric restriction and gentle exercise help to alleviate symptoms. Overexertion of affected limbs should be avoided. Using the affected limb for activities of daily living (bathing, hair-brushing) helps to drain lymph fluid. Supporting the arm on the back of a chair or couch provides helpful elevation for lymph drainage. In acute care settings, the affected limb should be identified by the patient and by health care providers using a loose-fitting, colored (bright pink) armband to ensure that blood drawings, injections, and blood pressure readings are not done on that limb. Skin should be kept clean and moisturized to limit chapping or chafing leading to breakdown. The patient is taught to avoid cuts and abrasions, as when using kitchen knives or other implements, to wear gloves when gardening and to wash and inspect skin after such activities, and to clean any skin breaks that occur, treating them with an antibacterial cream or ointment and a sterile dry dressing. In cases of lower extremity edema, sitting with the legs in a dependent position, crossing the legs, or standing for prolonged periods should be avoided. Extremes of heat and cold exposure should be avoided. The health care provider should be notified if the limb develops a rash or itching or pain or if the patient develops fever or flulike symptoms. Local support groups can assist patients in dealing with body image issues, and fitting clothing to asymmetrical limbs. Resources for further information on lymphedema management include The National Lymphedema Network and other support organizations such as the American Cancer Society. Obstruction of the lymphatic channels, producing edema and occurring mostly in women between the ages of 10 and 25. Its cause is unknown. The interstitial fluid that accumulates first appears in the feet but can travel proximally to the trunk and continues to accumulate throughout life. When the edema becomes severe, it predisposes the patient to chronic ulcers and superimposed infections of the legs. Swelling (especially in subcutaneous tissues) due to obstruction of lymphatic vessels or lymph nodes and accumulation of large amounts of lymph in affected region. acute or chronic aggregation of lymph fluid in local tissues caused by obstruction to flow in lymphatic vessels or through lymph nodes; common causes of obstruction are aplasia, hyperplasia or hypoplasia of lymphatics or nodes due to inflammation, trauma or neoplasia, or secondary due to compression of these by adjoining organ enlargement. Aplasia of lymph nodes is an inherited disorder in cattle, dogs and possibly pigs. The diagnosis of lymphedema was generated based on patients' medical history, physical examination, and indirect radionuclide lymphoscintigraphy. Impact of community-based lymphedema management on perceived disability among patients with lymphatic filariasis in Orissa State, India. In the Physical Activity and Lymphedema trial, Shayna L.
Primary lymphedema associated with systemic or visceral involvement. Subsequently lymphangioma develops in long standing lymphedema due to proliferation of lymphatic vessels. 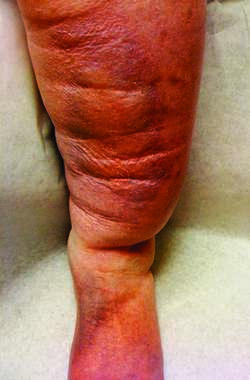 This patient's remarkable swelling in the thigh, not associated with any particular erythema or warmth, resolved quickly with lymphedema treatment. There are also reported cases of angiosarcoma of congenital nature and other causes of chronic secondary lymphedema, such as posttraumatic or post radiation lymphedema and also cases of upper limb angiosarcoma after breast-conserving therapy [2-4]. In the past, the role of exercise in preventing and treating lymphedema was unclear, but a recent study found that a strength-training exercise program helped relieve symptoms or lymphedema and provided additional benefits to patients. First in the year of 1997 Rasim SarybaE- found himself as struggling with this illness in left part of his right leg, which began to swell up and then he took a series of treatment from lymphedema a kind of elephantiasis and partially recovered.